Receding or balding hairlines, cowlicks, unusual hairline growth patterns and a double crown can be the source of real frustration when it comes to finding a hairstyle and styling your hair. To give you a better understanding on these types of hair problems, TheHairStyler.com has put together a simple guide for the most common hairline/growth problems. Your hair can start to thin out for a number of reasons. Things such as hormones, health, diet, stress, trauma and age are usually responsible for most hair loss. Hereditary: In adult men, hair loss or a receding hairline is most likely the result of hereditary factors, passed down genetically from either parent. Stress: Sometimes, as in times of intense stress or trauma, the process of hair loss is suddenly accelerated. Stress or worry is recognized as one of the main factors in causing dull, lifeless hair. Even baldness can result from continued strain and from the lack of relaxation of the scalp muscles, which often takes place. Diet and nutrition: Well balanced meals are essential towards maintaining natural hair growth. 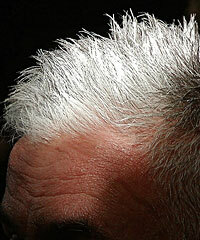 Age: Elderly people invariably show the effects of the passing years by a progressive thinning or loss of hair. Hormones and glands: Hormones are chemicals manufactured by glands. Hormones are circulated around the body through the blood and lymph systems. Hormones can have many unusual effects on hair growth and hair loss, from adolescence, through to old age.Your hair has its own. Hair grows from a tube like structure called the hair follicle. Each follicle has a definite age, and when the hair reaches this natural limit, it falls out or is combed or brushed out. The follicle has a short rest period (from 2 to 6 months) and then begins to produce a new hair. The new hair can grow from 2 to 4 years before stopping, resting, and then shedding. Not all hair falls out at once, as a matter of fact it's fairly normal to lose between 50 and 100 old hairs a day. This means that 50 to 100 new hairs should appear every day to keep up hair numbers and to stop thinning. Balding and receding problems begin when the follicle doesn't regenerate a new hair and dies. Many treatments have been manufactured and tried for hundreds of years but to no avail. Tonics, lotions and hair creams have not had a great deal of success on already dead hair follicles. There does seem to be a few products on the market currently that when taken orally, go directly in the blood stream to work internally. These products are getting some good results but it seems that only in cases of mild to medium hair loss (hair that has only recently started to thin out) and if the treatment is taken continually. A cowlick is an irregular growth pattern that occurs around the hairline, most noticeably in the front hairline, you are born with it and it is purely genetic. Hair grows through a tube called the hair follicle. In the case of cowlicks hair follicles grow in two or more directions, resulting in opening or lifting of the hair. A widows peak, in the nape of your neck, results from the same reasons as cowlicks. Things to try to lessen the strength of cowlicks and unusual growth patterns include, proper hair cutting techniques where the hair is left heavier in these areas. In the bangs for example, straight bangs would in fact need to be cut uneven in order to appear straight. Layers should be kept longer so that the weight will hold down the cowlick or growth pattern areas. Certain styling products such as strong hold mousse and gels will also help to keep these difficult parts of your hair in place. A body wave/permanent wave, straightener would also help fix the problem. These changes are done chemically; therefore they actually work better and last longer if done correctly. They can temporarily reverse nature, and make life a whole lot easier. Unusual growth patterns can be fixed and we suggest using our hair consultation to find the right kind of hairstyles to help minimize unusual growth patterns. A double crown is a hair growth pattern that can cause considerable problems to a hairstyle. The most common problem is where the hair is cut too short and sticks up as a result.The only advantage with your double crown is that you most probably can part your hair on either side of your head. Chemical intervention, such as permanent waving or straightening, can help crowns to sit better for a short period of time. Proper hair cutting techniques can also help to keep your double crown more settled. We recommend trying hairstyles that are longer and heavier on the top. Although not all hair growth problems can be fixed, their effects can be minimized and flattered with the help of the right hairstyle.